Deplicate - Fictitious word that means to render a puzzle unsolvable. To completely understand the inner workings of deplicating a Rubik's cube, one must first understand how to solve a Rubik's cube. Fortunately, to deplicate a Rubik's cube there is no need know how to solve them. Generally the deplication of a Rubik's cube requires no tools. Sometimes, especially on newer Rubik's cubes, they can be tight and the use of a flat head screw driver or key is helpful. It is advised to have read through this document before proceeding to deplicate. 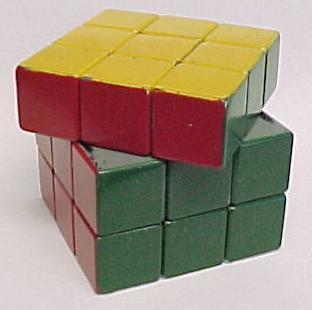 It is not necessary to have your cube solved before it is deplicated, but for the purposes of this "how to" documentary all of the figures are of a solved Rubik's cube. 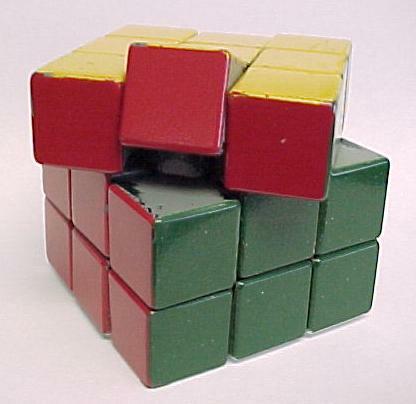 To start, turn one face of the Rubik's cube at a 45 degree angle, as shown. At this angle it is easy to pop out one of the center blocks of the angled face. If it is not this is where a flat head screw driver, key, or other small thin sturdy tool comes in handy. Once one of the center blocks has been removed be cautious, for this is also the first step in the disassembly of a Rubik's cube. From here the cube can easily turn into a small pile of colored blocks. 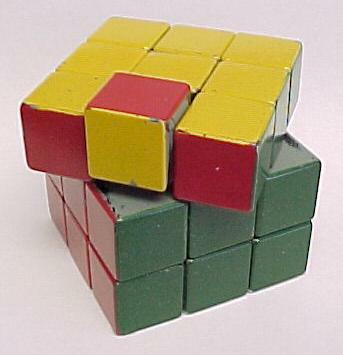 Ideally deplication of a Rubik's cube is done on a table or other surface that is free of clutter. Once the piece is out deplication occurs simply by turning the piece around and placing it back in the hole it came out of, thus transposing the two colors. The deplication, if the cube is unsolved, will go unnoticed to even the experienced cube master. Deplication detection doesn’t generally happen until the third stage of the solving is attempted. A companion of mine once aided me in creating an animated gif that portrays a deplicated Rubik's cube being solved. I included this to help show why a deplicated Rubik's cube is unsolvable. 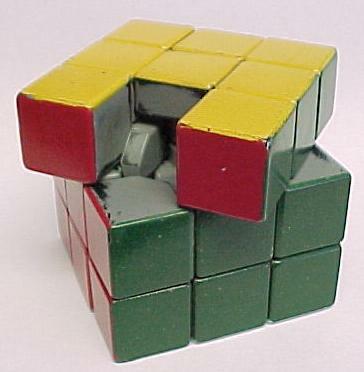 The final move to solve a rubik's cube requires at least two pieces be in the wrong place. 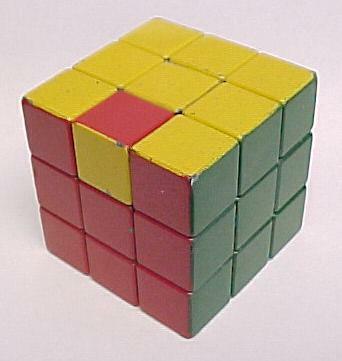 A deplicated cube only leaves one piece wrong and there is no move to fix this. I'll point the rest out for you tonight. Nice work man, very nice work, well done. However deplicate is not a fictitious word. It is a word that is not fictious, and it has a useful meaning even. Technically you are right it's not a fictious word, it is a made up word. Making up new words is always fun. Especially when others think they are "real" words and that you have a massive vocabulary.